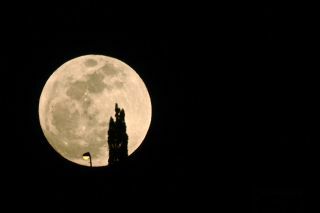 Skywatcher Roberto Porto took this photo of the biggest full moon of 2012, a so-called supermoon, in Costa Adeje, Tenerife, Spain, on May 5, 2012. There is more to a "supermoon" than meets the eye. "It doesn't matter where you are, the full moon you're seeing will be the biggest for 2013," Michelle Thaller, the assistant director of science at NASA's Goddard Space Flight Center said. "… That 12 percent size different can mean as much as a 30 percent change in the brightness, so this will be a particularly bright supermoon." Weather permitting, everybody should be able to see the supermoon. The moon will be rising from the east right around sunset, Thaller said. It will appear huge and low on the horizon before rising brightly into the sky for the night. Saturday and Sunday should both be ideal viewing opportunities. You can also watch a live webcast of the supermoon on SPACE.com beginning on Sunday beginning at 9 p.m. EDT (0100 June 24 GMT), courtesy of the online Slooh Space Camera, an online skywatching website (http://www.slooh.com). The distance from the Earth to the moon varies along the rocky satellite's elliptical orbit. Perigee differs from month to month, so sometimes the supermoon is a little closer or further away, Thaller said. "The closest the moon gets can actually vary much as much as the diameter of the Earth," Thaller said. "That seems like a pretty big number, but the moon is actually 30 times the diameter of the Earth away from us. If you line up 30 Earths, that's about the average distance of the moon away, but as it swings a little bit closer to us, that distance can vary." The sun can be to blame for the difference in distance. In the winter, when the Earth is closest to the sun, a supermoon could be even closer and more stunning, Thaller said. The strength of the sun's gravity pulls both the moon and the Earth towards it slightly, making the moon dip closer to the planet. "The supermoon for [scientists] is a fun chance to talk about the changes in the sky [and] observing the universe," Thaller told SPACE.com. "As scientists, we like to observe the moon a little bit closer up and right now we have LRO, the Lunar Reconnaissance Orbiter, a spacecraft actually orbiting the moon. We're taking these incredible high resolution pictures of the entire lunar surface." Editor's note: If you snap an amazing photo of the Sunday supermoon and you'd like to share it for a possible story or image gallery on SPACE.com, please send images and comments, including equipment used, to managing editor Tariq Malik at spacephotos@space.com.